The final month of the year! Very soon we will be awarding our new high school scholarships. How many we award depends on you. The more money we have the more children we can help. It is just that simple! If you have already helped this year, thank you so very much. Please tell friends and family about the work we are doing and ask them to help. To reach our goals, we need many more people to donate whatever amount they can. Of course, all donations are tax deductible. $3,500 gets someone a sponsorship of one student for four years. $1,750 gets the same for two years. Or, someone can just donate whatever amount they are comfortable with. 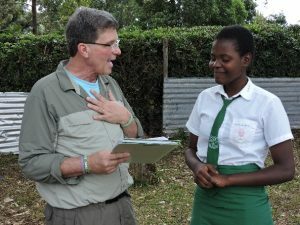 I recently returned from my sixth trip to Kenya and it was a great success! Also on this trip I visited twelve vocational/technical/nursing schools. Since we want to soon start sending some children to these types of schools, I needed to learn a lot about the schools so we can make good choices per which schools to send them to. I had quite an education. This is a major step forward in our foundation as this is much more complicated than sending children to high school. I spent a lot of time with the parents, students and staff of the Dago Primary School. I always like to check in with them to talk about what we are doing at our foundation and see what is new with them. My main message to all of them is that we want all students to stay in school through Class 8 (8th grade) and take the KCPE Exam. One of the big challenges is that so many students, especially girls, quit school around Class 4 or 5. 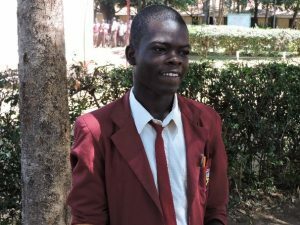 We are seeing this get better as our scholarship fund offers some real hope for those who make it to Class 8 and take the Exam. Over and over I shared the message, especially with the students, if they do not at least stay in school through Class 8, their life probably cannot be any different than their parent’s lives. I told them if they make it through Class 8, we will do everything we can to help them. We are always looking to share our story by speaking to community groups, places of worship, service organizations, etc. If you would like to arrange a presentation, please contact me. If you have not read my book about all of this work, “Just Give Them A Hug…And The Rest Will Be Easy”, please go to Amazon or iUniverse to purchase the book. All proceeds go to the Weiss Scholarship Foundation. We are always looking to get word out in the media about the Foundation and the Dago children. If you have media connections and can help in this regard, please contact me. If you have questions, comments, ideas, suggestions, etc. please get back to me. The more people who give us input, the better we will be. We do this work because we believe in Empowering Children to create a world where every child has the opportunity to get a great education.